I made these especially for you because I know about your salty-sweet addiction. I know you can never decide between the salty pretzel and the sweet pretzel with chocolate drizzle at the mall, and so you buy both. I’m just like you. This bread pudding is so good. So so so good. I’m not even a bread pudding fan, but I will eat this salty vanilla-chocolate version. Up until now, I thought the only bread pudding I liked was my bread pudding with whiskey sauce. But this salty-sweet version with the malty soft pretzel is my new favorite. I sliced up soft pretzels and topped them with vanilla custard and chocolate chips. 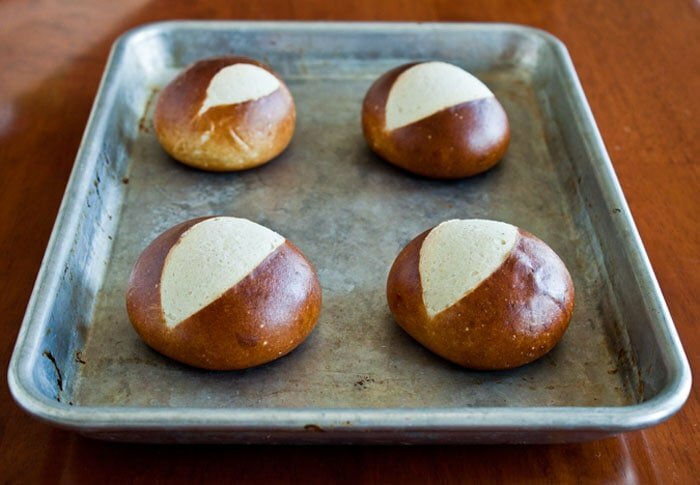 I used these mini pretzel rolls that totaled 8 ounces in weight. If you have regular soft pretzels or pretzel bread, just weigh your pieces. I baked these up for sweet Megan of Stetted. We’re throwing a baby shower for her today, and thought she might could use some casseroles to get her through the first few weeks of life with a new baby and a 6-year old son. 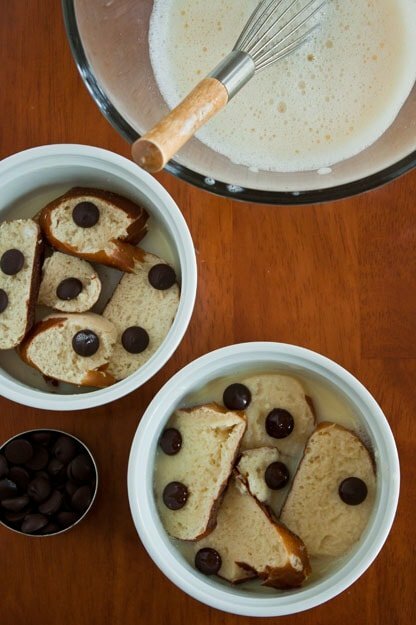 I imagine that one night, after putting both kids to bed, Megan and her husband will bake these mini bread puddings for two as a special treat. I’m betting that little brother will wake up at the smell of these baking and want some, too! You can make these ahead of time in ramekins, and keep them in the fridge for up to 1 day before baking. Not that you could wait more than 24 hours to bake up these beautiful bowls. If you want to double the chocolate chips, that’s great. If you want to use extra chocolate chips to melt and pour on top before serving, even better. So, happy baby shower day, Megan! We love ya! And we’re all here for you. We’ll bake you a casserole anytime you need us. If you're going to be baking these immediately, preheat the oven to 350. Butter two 10-oz ramekins with the butter. Slice the pretzel into thin slices about 1/2" thick. Set aside. In a small bowl, whisk together the egg yolks and sugar vigorously until the mixture is pale yellow and falls from the whisk in ribbons, about 3 minutes. In a small saucepan, heat the milk, half and half, and vanilla over medium until almost simmering; small bubbles will form around the edges of the pan. Turn off the heat. Slowly stream this mixture into the egg mixture, whisking constantly. Layer pretzel slices to cover the bottom of each ramekin. Sprinkle 1/4 of the chocolate chips in each ramekin. Add 1/4 of the cream mixture in each bowl. Repeat the process to finish the bread and custard mixture. Make a water bath for the puddings to bake in by placing the 2 ramekins in a small casserole dish and adding hot water to the pan until it comes up half-way on the sides of each ramekin. Bake for 45-55 minutes, until the bread pudding puffs up and turns golden brown on top. Let cool in the water bath for a few minutes, then carefully lift the ramekins out of the water bath. Serve warm. This looks great. I have never made bread pudding before so need to try this soon. It night be a winner in my household. Oh my gosh, wow! How awesome are these? Chocolate, pretzels and pudding! Sweet, salty and delicious! I love anything sweet and salty and this bread pudding is no exception- I love those pretzel rolls! Happy Baby Shower Megan! Oooh.. now this is right up my alley and should of been my breakfast!! oh my! These look fantastic! I adore your little coffee pot too, so cute! Maybe a silly question, but what is pretzel bread? Is it just like a dense bread? These sound fantastic! I love a sweet/salty combo…especially if chocolate is involved! These look increeeeeeedible. I’m not even going to make sure that word is spelled right. I just want this. The mister just started a new diet that means these are completely verboten. So, I think it’ll be two for me and bump! And I’m not even going to feel guilty about it. Thanks for joining us in the shower, Christina! Please please please let’s meet in TX and make these together. YUM! You are such a mind reader!! Sweet and salty for the win!! I am seriously going to defrost my pretzel buns today!! What a great idea!!!! 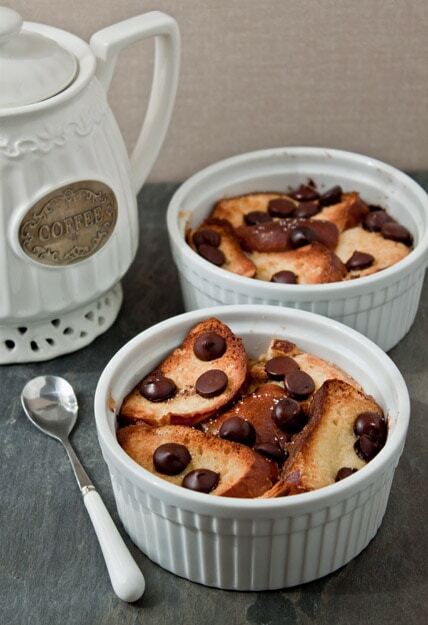 What a perfect idea for bread pudding! Love sweet and salty! I bet you a million billion dollars that Julie Swope sees these and makes them within the next two weeks (more likely one). Love the sounds of this unique take on bread pudding! I’m a sweet/salty fan for life! This? Is dangerous. I love pretzel bread and I love bread pudding, so….yeah. What a great idea to use soft pretzel in a bread pudding! So clever, and sounds delicious! I’ve never actually had bread pudding; it’s never really appealed to me.. but THIS. Sweet and salty.. I can go for that. YUM. My mind is blown a little right now. This is fabulous! Saw this on instagram, came straight over. DELICIOUS! I am a SUCKER for bread pudding and for salty sweet. Not even preggers and craving both of these servings like whoa! Gorgeous photos too! I kind of wish this was a real-life shower that I could crash and eat this bread pudding! I can’t even … PRETZEL BREAD PUDDING? Duuuude. Wow, these look fabulous! So creative and fun! 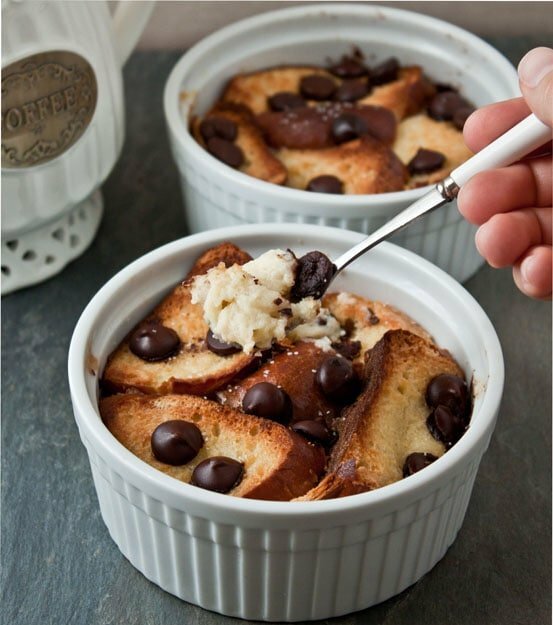 Such an awesome idea for bread pudding! I love the sweet-saltiness of it! This looks so amazing, who could possibly resist this salty sweet combo! This is just genius – I love everything about it! I’m not big on pretzels (I know, weird) but my husband LOVES anything pretzel-related. He’s also a major chocoholic, so he’d adore these. Thanks! I love this salty sweet combo. 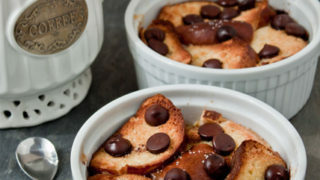 I have never had bread pudding before, but I definitely will be trying this! Um, YUM! You definitely know what a pregnant woman wants right now. Thank you so much for making me and baby #2 feel so special! oh wow, those looks amazing. I love bread pudding but I’ve only ever made it with sweet rolls. How yummy this must be with pretzel rolls!